YouTube Channel ‘A Fragrant World’! This project began as a few poems written on the issue of wide-spread usage of tobacco and cigarettes. A bunch of poems turned out to be a book or say a booklet in March 2018. The book was released with a group of friends in Calgary and Vancouver, both on 18th March, 2018.
collectively if our world abandons smoking. With confirmed health hazards, tobacco and smoking have resulted in awful results. With smoking made history, the results will be wonderful! Eventually we thought that an online outreach was an imperitive “must”! Here, we are sharing our work at www.AFragrantWorld.com. 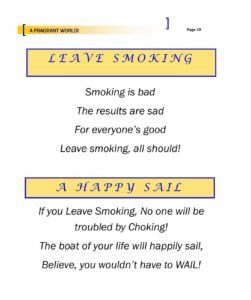 We wish and hope that this message of a non-smoking reaches out far and wide. We look forward to your volunteerism and time for making our planet, tobacco free in the coming times. A Special outreach to “Make Smoking History” groups and cancer concerned groups would not be out of place! Together, we can make a difference! Volunteers @ A Fragrant World!